Devotion changes your mental, emotional and physical vibration, spiraling you up, to never fall back again.. To have a spiritual practice is to create an inner craving, that can only be satiable by your next immersion within, nothing else can replace it. Devotion is like rocks stack in perfect balanced on top of each other, at each spiritual practice a new perfect balanced rock is laid reaching new height, closer to God. Your enlightenment is reached when your first rock of devotion is sitting on earth and your last one on top is entering heaven. Prayer creates the most powerful Universal Vibrations, it literally can move mountains. When you understand why you should forgive everyone in order to become a Realized Souls you will devote time to create this peace and harmony. For anyone wanting to grow spiritually, this is at the core, the foundation for your expansion of God within. Read below to truly understand this essential truth. The Prayer of Reconciliation (to remove any frictions from the past) written below very few have the courage to do it. Yes you are one of them. Then nothing can hold between you and God. That God give you strength. 1- Do it 7 days or 21 days consecutively. You and I are one in God. Thank you very much!! Thank you very much!! What does it mean to pray? The dictionary says it comes from the Latin word for asking. This is know as the petitionary prayer. There are also meditative prayer, prayer of praise and adoration, and prayers of thanksgiving. Digging deeper the Latin word for prayer came from an even older source, Sanskrit, the ancient, holy language of India. In Sanskrit to pray means to "judge yourself wondrously made." Don't forget sometimes "God's greatest gifts are unanswered prayers." besides "If God had granted all my silly prayers, where would I be now?" Right after you become Reiki Practitioner Certified, is the best moment to Create a New Habit (as in Seiheiki symbol) by getting into the good practice of Self Healing, as our founder Mikao Usui did the 21 days meditation on the top of the Mount Kurama, so can you, by starting a 21 CONSECUTIVE DAYS of SELF HEALING, a good habit is to do this practice early morning, before you leave your bedroom. This can be done lie down on bed or on a sitting lotus posture as in meditation, do what feels best to you or experiment both, so to develop deeper awareness under any environment. This call conference addressing some concerns on practicing Reiki Self healing, specially right after they have taken their Reiki certification. A new and simple technique I created it, while you applying the SELF REIKI, when doing it laying down, try to use one PILLOW sitting on top of your chest/belly, then rest your two hands on top of the PILLOW, one hand aligned by the 4th heart chakra and the other by the 2nd Sacral chakra, then continue the REIKI CHANNELING, your are going to energize and heal the AURA as well as the chakras, it gives you an awesome feeling of expansiveness, and strengthen of the energy channeled. Also change the thickness of the PILLOW as to facilitate the reaching of different parts of the aura. You are going to recall any tough times you experienced on the past as: toddler, child, teen or adult and send Reiki back in time to heal that specific situation. Do the Distance Reiki not only once, but do it many times over to that traumatic moment in your life. That is indeed very healing, then you can also send healing to the past to all the people involved in that situation. Let's heal everything and with everyone involved (if needed do use the "Prayer of Reconciliation" described above). 1) List all the major past traumas/issues, as far back as you remember. You can even ask your parents or siblings. 4) Place the Rose Quartz Crystal on top of the described piece of paper from above. 6) All throughout this 3 weeks never remove the Rose Crystal from the top of the described paper with the issue to heal. 7) When one trauma/issue is done, start from 1 through 6 again for the next one in the list. This process can be repeated after 2, 3 or 5, years once again (save this list of traumas/issues) . The reason is that along the years your ability to channel a greater strength of ki / love will continue to increase, therefore deeper healing takes place. This we can call "time warping"/"curving time" because you are influencing what already took place far back in your life, so you can bear fruits of where you are/achieved today. The more you do this "Healing the Past" the more you "curve time" and "carve a new self". Very powerful indeed. "Meditate, infinity Love and Peace dwells within the finite body"
Music to bring the brain waves down into silence and Meditation. It helps you to train your brain to deeper levels of meditation. Enjoy, learn how to meditate. These songs are created to induce your brain into a deep silence, with Holodynamic Vibrational Entrainment Technology (HVET). Now that technology allows for precise research and studies, science is able to explain this phenomenon, which is now called brainwave entrainment. Use it at maximum 15min. each time. You can use twice a day, morning and evening. Additional information can be found on the website below (how the brain waves works, and these technology works as well). You can purchase songs on the website below, I advise to buy songs with Theta brain waves on it, and if you decide to buy with Delta Brain waves, please use with caution because they are a lot deeper. Please don't bother with Alpha Brain waves, they are very mild levels of meditation. The Power of 21 days "POSITIVE AFFIRMATIONS" repetition. An Affirmation is a positive statement that we make to ourselves in order to focus our thoughts on a particular feeling or goal. ​How to use affirmationsUsing affirmations is easy. Decide on what you want and pick two or three of your favorite affirmations and write them down. Make sure that you place these affirmations somewhere that you can see them. then, at least, three times a day repeat each affirmation a minimum of ten times. You can do this anywhere, you can say it just to yourself but they are more powerful if you say them out loud. You can do this while walking, while in the shower while driving it does not matter just get in the habit of doing it. You should always say your affirmations as early in the day as possible to get your day started on a great positive note. The law of attraction is working for me. I am manifesting my destiny. My powers of manifestation are growing. Every day I attract people who help me towards my goals. As I think a thought, energy is put in motion to create my new reality. I feel good and good is attracted to me. Everything I need is on the way to me. I am a magnet to money, prosperity, and abundance. Money serves me I don’t serve money. Every day I am attracting money into my life. There is enough money for me to do all I wish. I use the money for good and I am grateful for my good and the riches of my mind. I am already in abundance. Money allows me to do good in the world. I am creating unlimited wealth. I give from abundance and receive abundance in turn. There is more than enough to go around. I deserve to have wealth in abundance because I care about making a difference in the world. I am loving and I am loved. I am ready to be loved. There is so much love in the world. Love and I are a perfect match. I believe completely that I am attracting my soulmate. I always project loving and welcoming energy. An infinite positive loving energy is growing between myself and my partner. Each day I experience more love in my life. I am focusing on what I love to bring it to me. I allow the Universe to do the manifesting and focus my attention in this present moment. I believe completely that I am attracting my soulmate. Mantra, nature of mantra knowledge gave way to spiritual interpretations of mantras as a translation of the human will or desire into a form of action. In Hindu Upanishadic and Yogic thought, these sounds are manifestations of ultimate reality, in the sense of sound symbolism postulating that the vocal sounds of the mantra have inherent meaning independent of the understanding of the person uttering them. The most basic mantra is Aum, which in Hinduism is known as the "pranava mantra," the source of all mantras. The Hindu philosophy behind this is the idea of nama-rupa (name-form), which supposes that all things, ideas or entities in existence, within the phenomenological cosmos, have name and form of some sort. The most basic name and form is the primordial vibration of Aum, as it is the first manifested nama-rupa of Brahman, the unmanifest reality/unreality. Essentially, before existence and beyond existence is only One reality, Brahma, and the first manifestation of Brahma in existence is Aum. For this reason, Aum is considered to be the most fundamental and powerful mantra, and thus is prefixed and suffixed to all Hindu prayers. While some mantras may invoke individual Gods or principles, the most fundamental mantras, like 'Aum,' the 'Shanti Mantra,' the 'Gayatri Mantra' and others all ultimately focus on the One reality. Mantra japa was a concept of the Vedic sages that incorporates mantras as one of the main forms of puja, or worship, whose ultimate end is seen as moksha/liberation. Essentially, mantra japa means repetition of mantra, and it has become an established practice of all Hindu streams, from the various Yoga to Tantra. It involves repetition of a mantra over and over again, usually in cycles of auspicious numbers (in multiples of three), the most popular being 108. 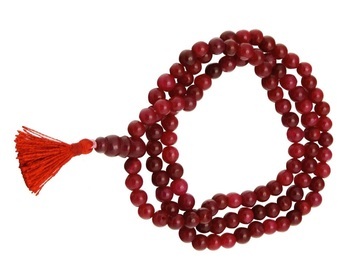 For this reason, Hindu malas (bead necklaces) developed, containing 108 beads and a head bead (sometimes referred to as the 'meru', or 'guru' bead). The devotee performing japa using his/her fingers counts each bead as he/she repeats the chosen mantra. Having reached 108 repetitions, if he/she wishes to continue another cycle of mantras, the devotee must turn the mala around without crossing the head bead and repeat. It is said that through japa the devotee attains one-pointedness, or extreme focus, on the chosen deity or principal idea of the mantra. The vibrations and sounds of the mantra are considered extremely important, and thus reverberations of the sound are supposed to awaken the Kundalini or spiritual life force and even stimulate chakras according to many Hindu schools of thought. Mala (bead necklaces) containing 108 beads excluding the head bead or guru bead. Cho-ku-rei: while repeating it mentally, visualize the Chokurei symbol at the Kundalini reservoir by the sacral are. Sei-hei-ki: while repeating it mentally, visualize the Seiheiki symbol at the Heart Chakra, in the middle of the chest. SVAHA means "may the meaning of the mantra take root in my mind." Play the video, close your eyes, sit still and let the vibration touch your chakras. Play the video, close your eyes, sit still and let the expansion of your aura be felt. Tray to bring your hands ready to channel energy at the chest's height approximate 10 inches away from your chest, where the right hand channels for the right side of your body and the left hand to the left side of your your body. The result feeling should be as if your aura has just been fluffed up, you can feel expansion and buoyant sensation. This mantra has a very tender healing vibration indeed. Om (Aum)- also called Pranav, Prana (vital vibration) which fills the Universe. (Aum that one syllable is Brahman). bhur bhuvah svah- "past, present, future" or "earth, air, heaven" or "gross, subtle, causal"
Below 2 videos with the Moola Mantra, enjoy!